Should Washington Pay Parents to Raise Future Taxpayers? For too long, Republicans and Democrats have paid lip service to the family, but offered little in the way of concrete family policies to shore up the eroding foundations of American family life in the United States. 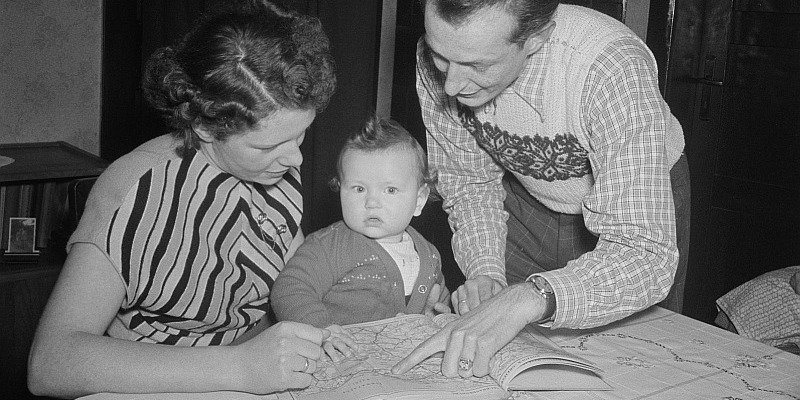 Senator Mike Lee’s announcement today that he is seeking to boost the child tax credit in a big way suggests that family policy may be returning to the public agenda. It’s about time. Over the last two decades, a marriage divide has opened up between college-educated Americans and everyone else. When it comes to marriage, the most educated and affluent Americans are doing well enough. The vast majority of them are or will be (happily) married, remain married, and have their children in wedlock; but the same cannot be said for their fellow citizens with less education and income. 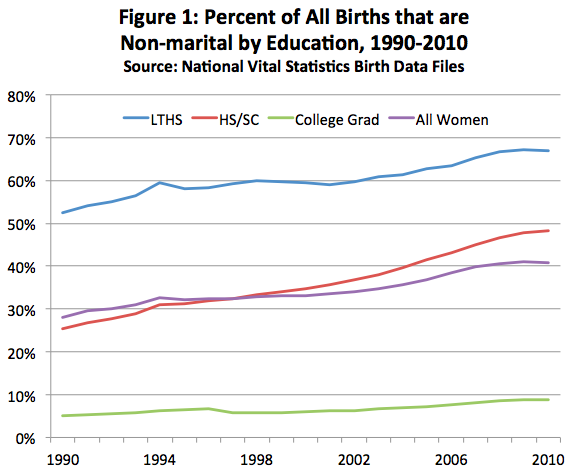 Figure 1, which breaks down trends in nonmarital childbearing by education, shows that nonmarital childbearing has grown markedly more common among American women without college degrees, even as it remains relatively rare among college-educated women. 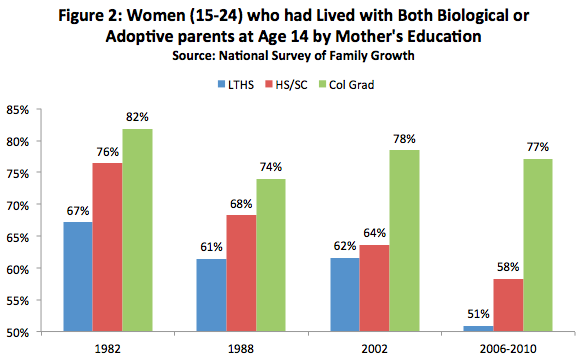 In fact, less than 10 percent of births to college-educated women take place outside of marriage, compared to more than 50 percent of births to less-educated women. One central reason that marriage is in retreat and families are more fragile in poor and working-class communities across the nation is that the economic foundations of family life in these communities have been eroding. 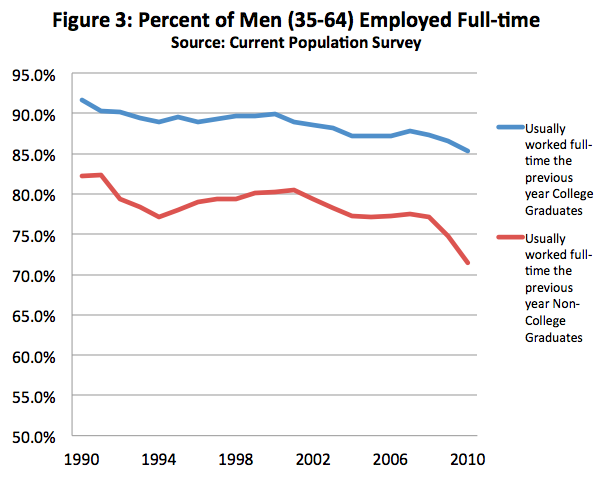 For instance, less-educated men have seen their real wages fall since the 1970s, and they are now much less likely to be able to find and keep a full-time job, as Figure 3 indicates. Because money matters when it comes to forming and sustaining a family, the falling economic fortunes of these men seems to help explain why nonmarital childbearing has surged and divorce remains high in poor and working class communities. To help American families, Senator Mike Lee is proposing a $2500 child tax credit that would apply to both income and payroll taxes (above and beyond existing child deductions and the $1000 child tax credit). Because many working-class and poor families pay little or no federal income tax, his focus on payroll taxes would put real money in the hands of these families. As sociologist Andrew Cherlin and I wrote in a recent policy brief for the Brookings Institution, a policy move like this is likely to: “increase marriage rates and marital stability among low- and moderate-income families who would benefit from the economic security such a policy would provide to their family finances. It would also signal to them that the nation values the parental investments they are making in the next generation, who—it should be noted—will be helping cover the cost of Social Security and Medicare in the near future.” Indeed, experimental efforts to boost the income of working parents in Minnesota and Wisconsin have been linked to higher marriage rates and lower divorce rates among low-income couples. Senator Lee’s proposal is only one step in the right direction. But what’s particularly encouraging about his proposal is that it would lift the sagging economic fortunes of many working-class families by targeting their payroll taxes. Let’s hope more Republicans (and Democrats) take a page from Lee’s playbook and seek policies that renew the flagging economic fortunes of family life in all too many of our nation’s poor and working class communities. Without strengthening these foundations, the United States is not likely to see the institution of marriage—and the stability, security, and opportunity it offers to the nation’s children—on the mend in the very communities that need marriage the most. W. Bradford Wilcox, a professor of sociology at the University of Virginia, is senior fellow at the Institute for Family Studies and a visiting scholar at the American Enterprise Institute.